This simple Vietnamese shrimp recipe combines all the yummy flavors of the Southeast Asian part of the world into one package: The shrimp are salty, sweet, savory and spicy all at once. Plus, they are easy to stir-fry and take only a few minutes to cook. Here are stir-fry cooking tips. Use decent-sized shrimp for this recipe (no smaller than 25 per pound) if you are serving this alone as an appetizer. If you want to top a rice dish with these shrimp to make the main course, you can use smaller ones. Read more about Pairing Wine with Fish and Seafood. With a sharp knife, slice down the backs of the shrimp to expose the black "vein," which is the shrimp's digestive tract. Pull out this little vein, but keep the shells on the shrimp. NOTE: These shrimp are served shell-on, which keeps them moister and gives them more flavor than if you removed the shell. But if shelling shrimp at the table is not for you, you can remove the shells and still make this dish. A word on the chiles. You can adjust the heat any way you want. You could use 3 Thai chiles for some serious heat, or 1 full cayenne would be similar, as would half a habanero. Or you can use less to your taste -- or none at all. Heat the peanut oil and sesame oil in a saute pan over medium-high heat for a minute or two. 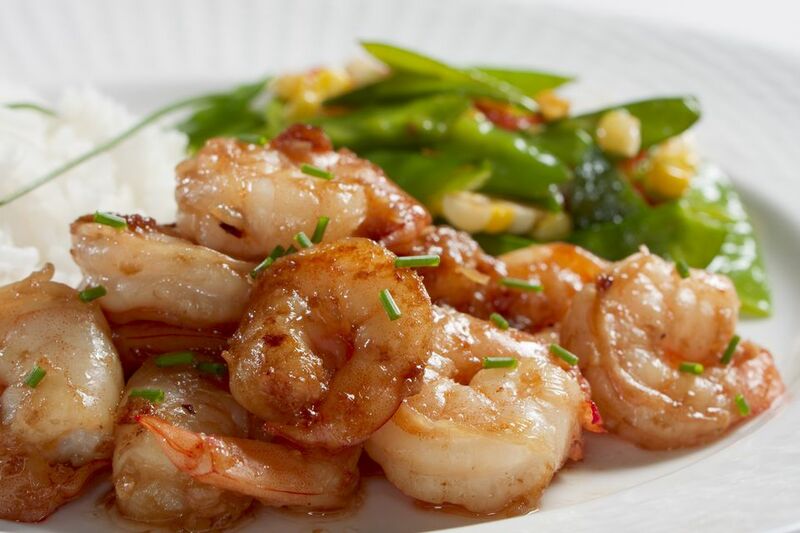 Add the shrimp and the honey or brown sugar and stir-fry for 1-2 minutes, then add the garlic and shallot and stir-fry for another minute or two. Add the stock (you can use water if you do not have stock available), fish sauce and salt and turn the heat to its highest setting. Let this boil down until the pan is nearly dry, which should only take a minute or two. Serve at once, garnished with the cilantro. This is excellent beer food, but a sweet-salty Thai limeade would be great, too (if you can’t find Thai limeade, just add a pinch of salt to your favorite limeade brand). As for wine, go with a Gewurztraminer or an off-dry Riesling, or maybe a tropical-tasting Roussane from California.